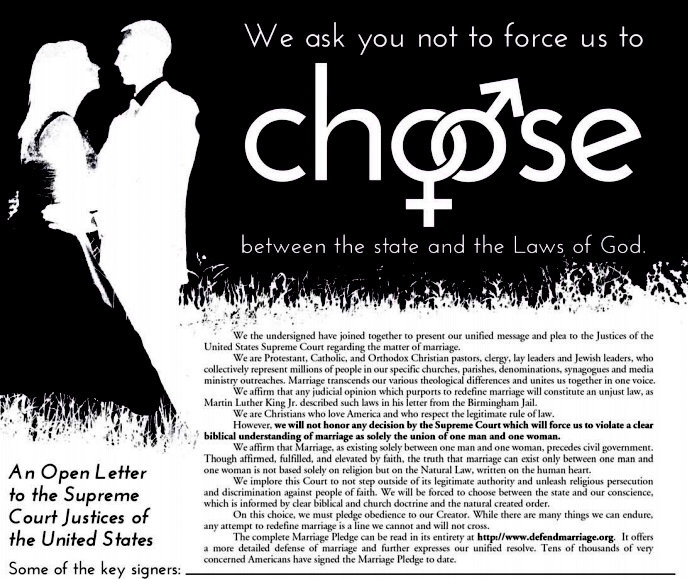 A number of anti-gay leaders and clergy have signed a full-page ad in The Washington Post promising that they will not honor a Supreme Court decision in favor of nationwide marriage equality. With a court decision due in the next several weeks, this group is resorting to desperate measures including passing Jim Crowe type laws against LGBT equality and threatening civil war over a probable positive decision for gay rights. Among the signers at the bottom of the ad are Mat Staver, Elaine Donnelly, the Benham brothers, Alveda King, Jim Garlow, John Hagee, E.W. Jackson, Don Wildmon, Dave Welch, Robert Jeffress, and Penny Nance. Ironically, a new poll indicates that 65% of Americans believe that SCOTUS will rule in favor of marriage equality. Get ready for heads to explode.